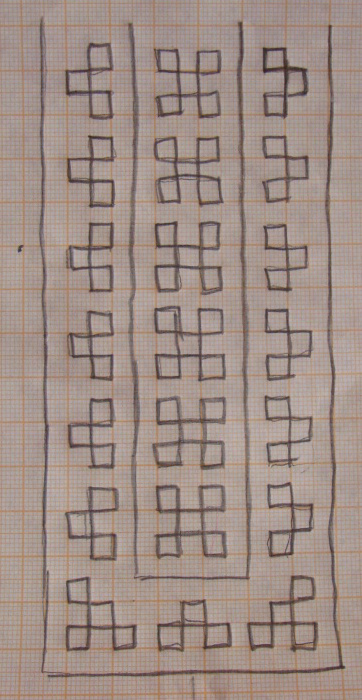 Some more variations were worked on the sampler. 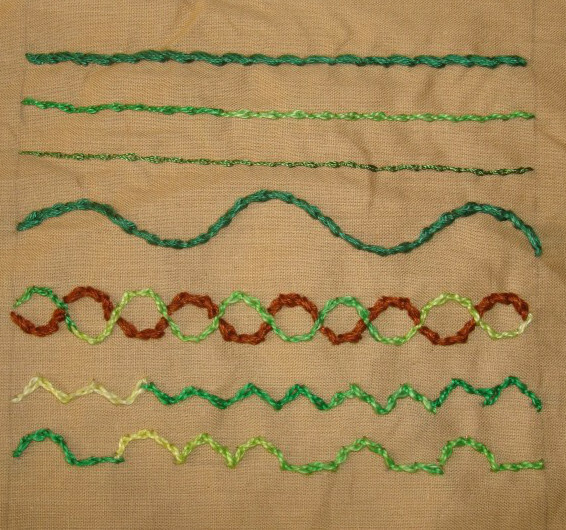 Two rows of rope stitch are worked in the same direction in the first sample, three rows of rope stitches in a curve in different shades of green are worked in the second sample, in the third sample, rope stitches worked with perle cotton and cotton skein are combined. 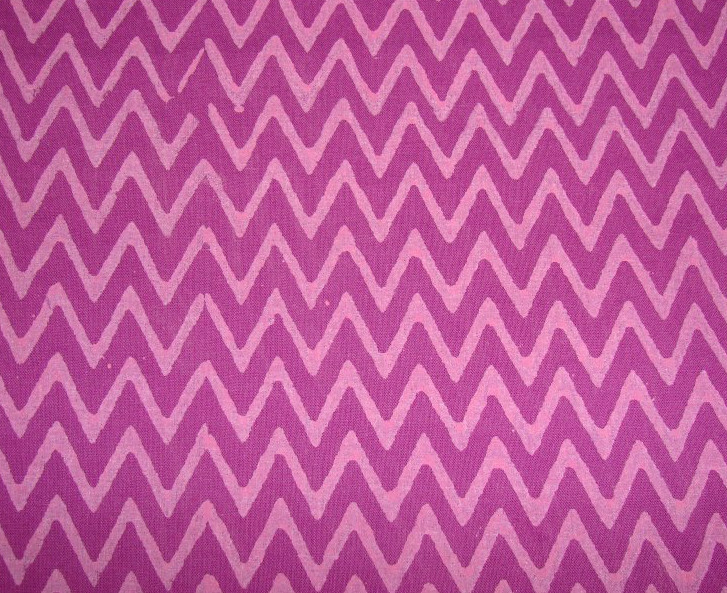 perle cotton and silk threads are combined in the fourth sample. 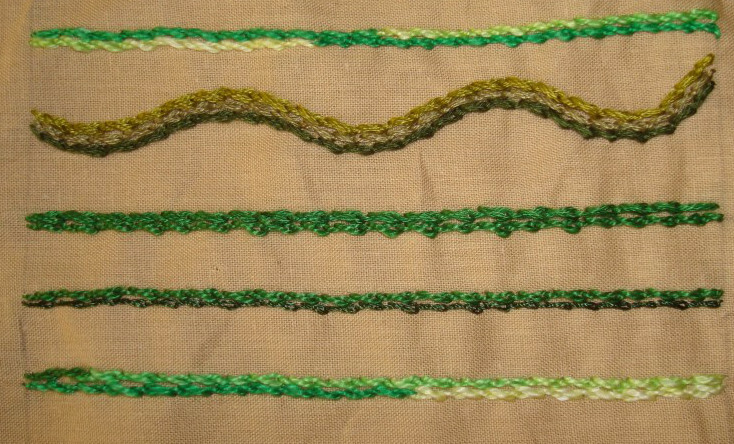 Rope stitches are worked in opposite directions in the fifth sample. 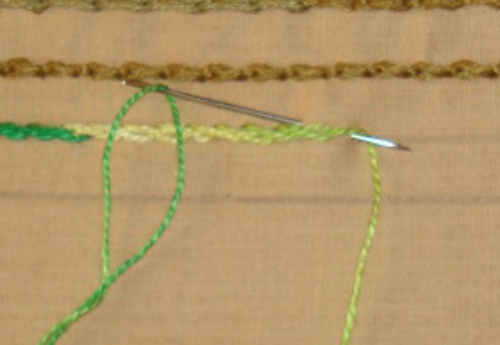 Wide and normal version of rope stitches are alternated in the sixth row. This black yoke was completed. 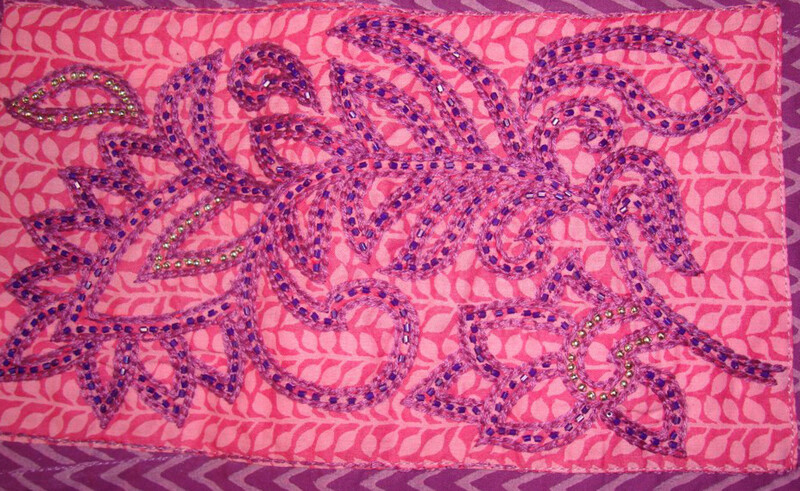 I added round silver beads on the border and oval beads in between the feather stitches. 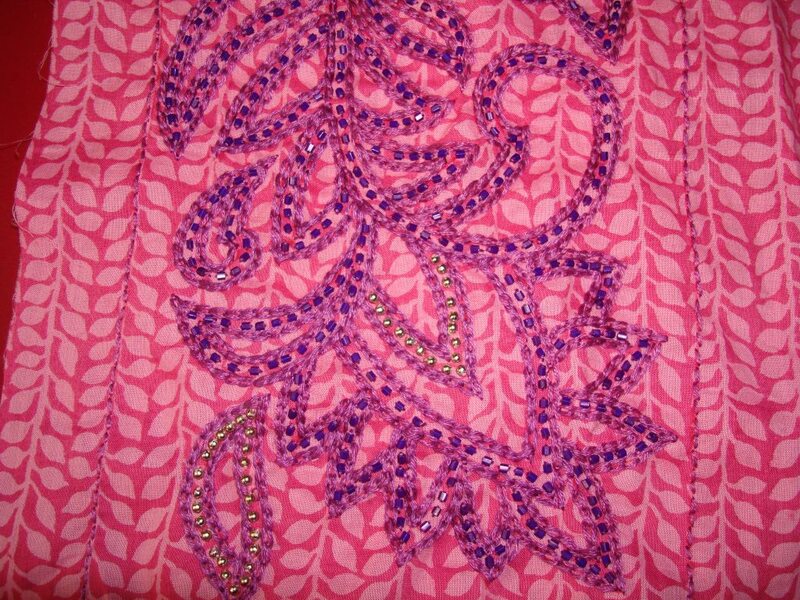 the sequins are added inside the flowers, one piece is glittering!and I am waiting for the tailor to return from his vacation in Pakistan. That will take another two weeks. I am working on rope stitch sampler now. I am still in the thinking stage of the hussif project. I have started another tunic project. 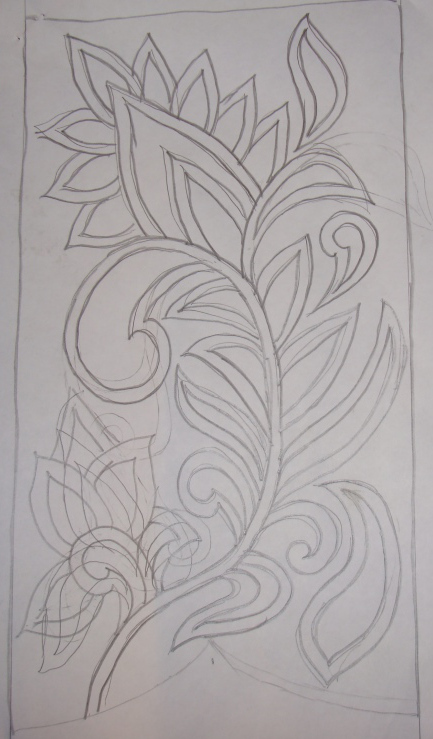 This time there are only borders, the design is based on ethnic Indian embroidery . 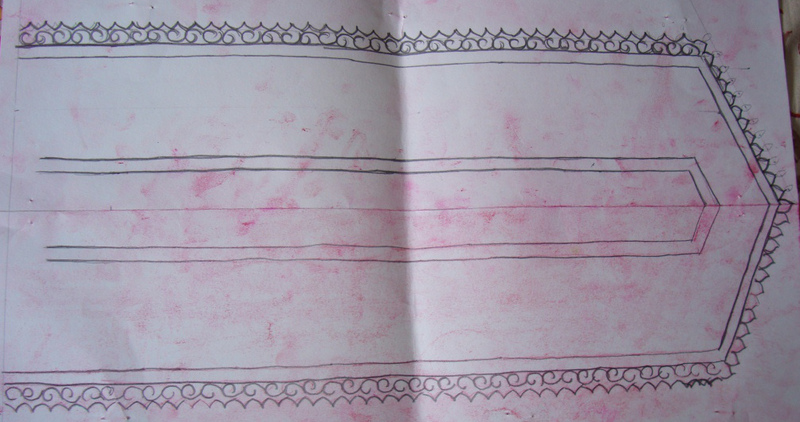 It has kutch work motifs on border. A time consuming project. 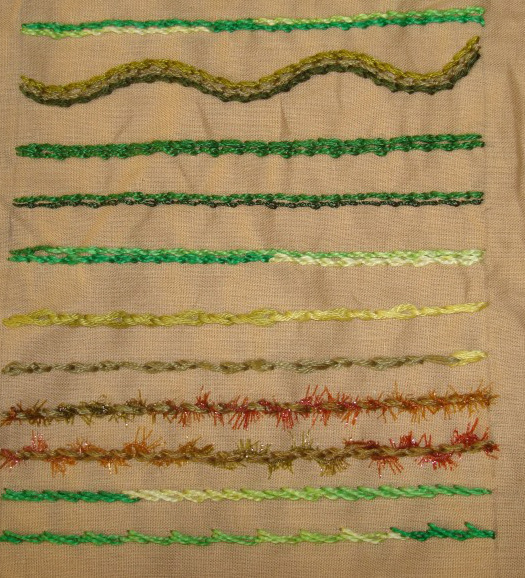 This week’s stitch on TAST challenge by SharonB is rope stitch. 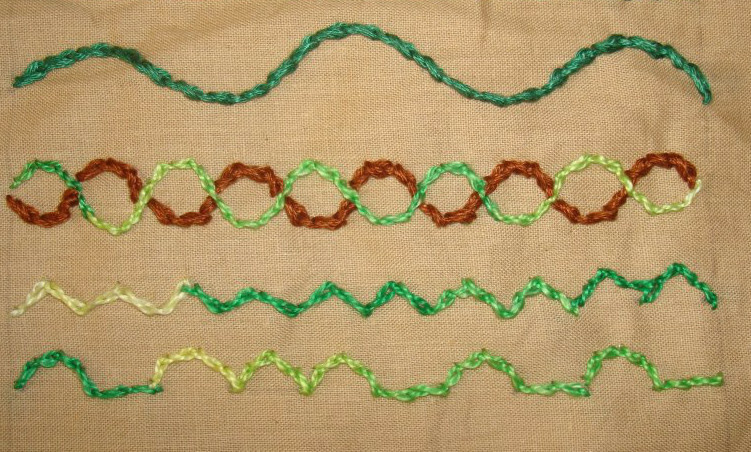 This stitch is a variation of twisted chain stitch. I worked some samples. 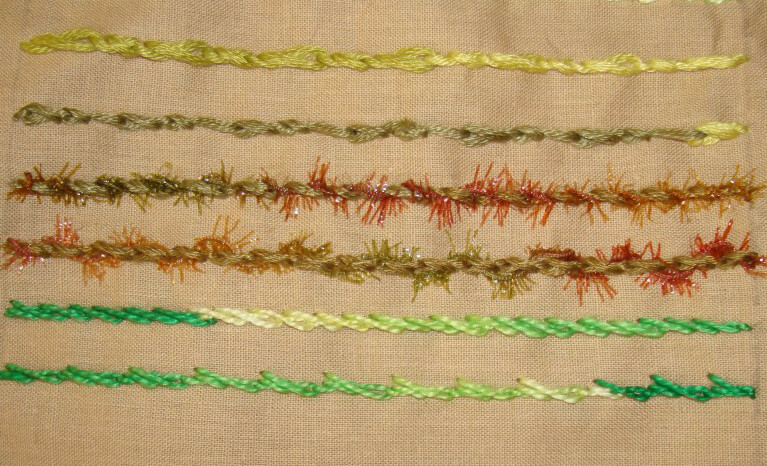 The stitch worked with different threads- cotton skein, perle cotton and fine silk thread. 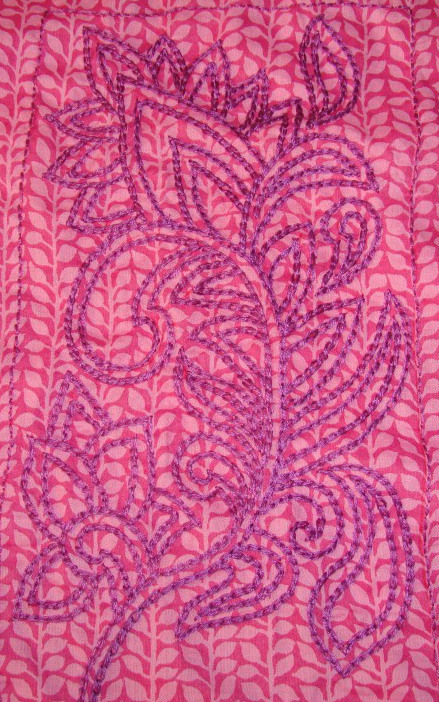 Rope stitches worked in scallops and curved lines. 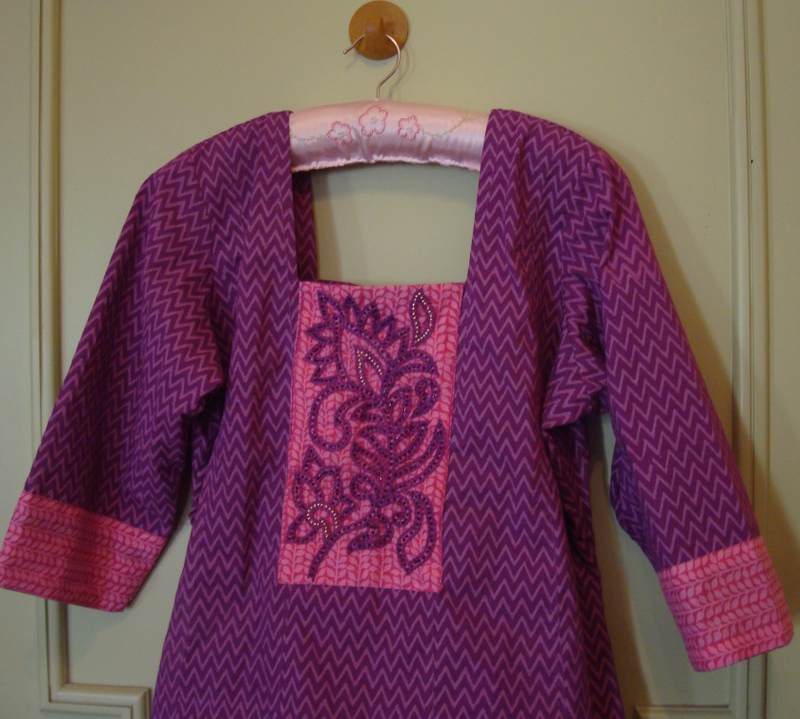 I have tried some new ideas on some of my tunics. This is one of them. Queenie as you requested I have posted details of the work. Last year my younger nephew, Balaji got married. 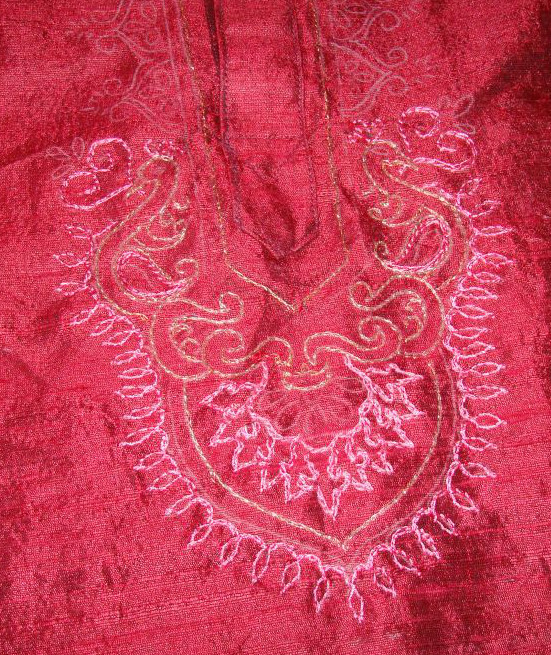 I designed and embroidered a maroon silk kurtha for his engagement. Here he is in his engagement attire. 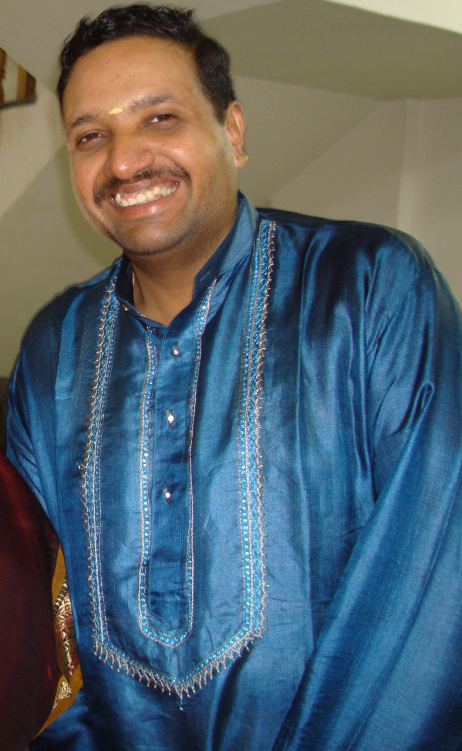 He wore a cream narrow salwar [Indian leggings] to match this kurtha. 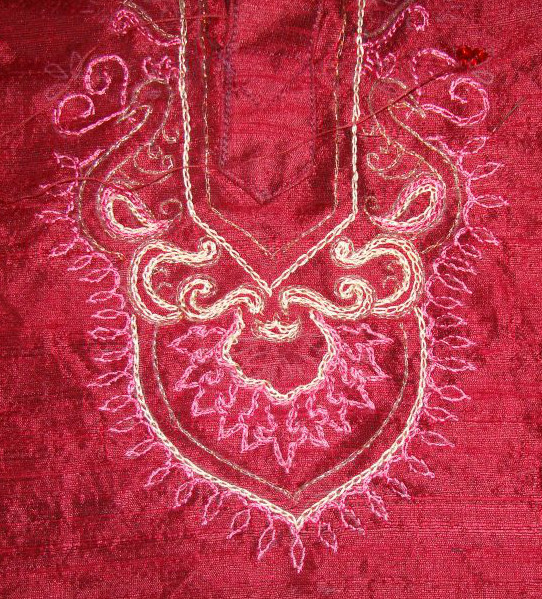 The embroidery was done with silk and metallic gold threads- the embroidery detail of the borders. 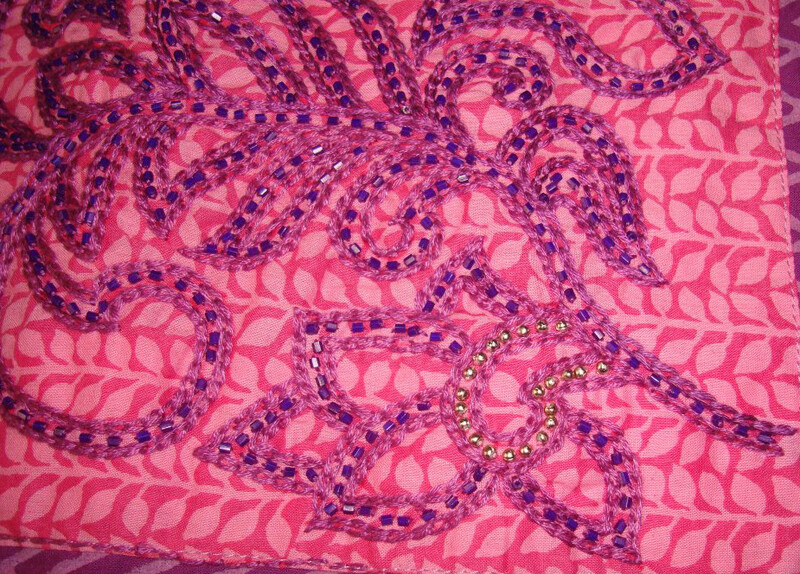 Balaji loves peacock design. The details of the embroidery on this twin peacocks. 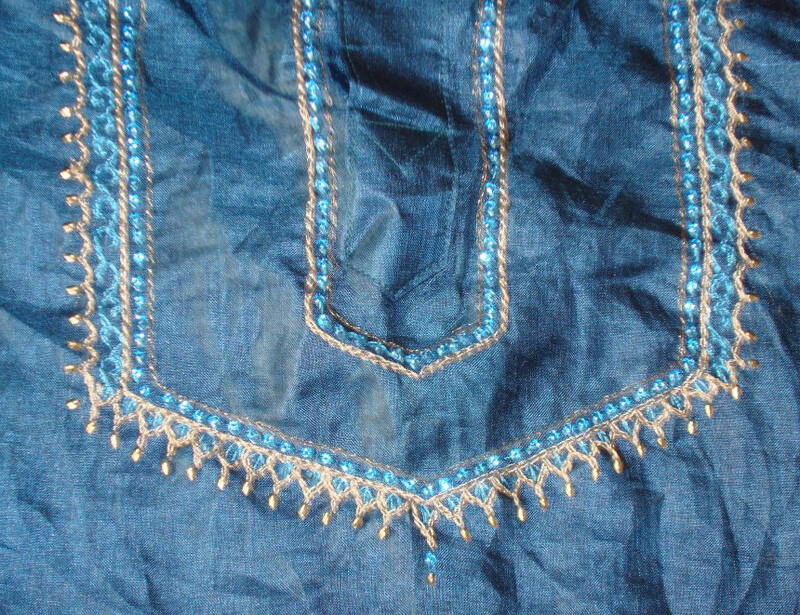 The same peacocks after stitching with cream thread. 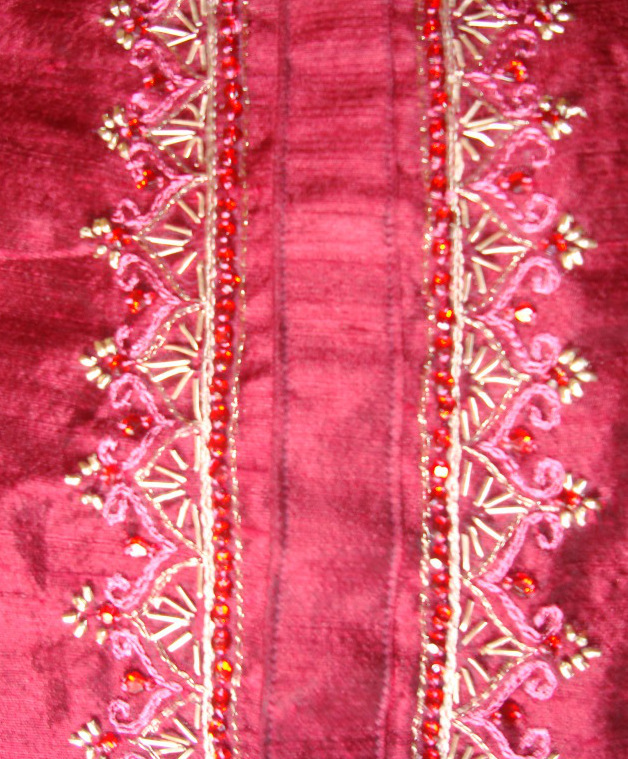 Zardosi beads were stitched on the spaces made by the arches and red stones and beads were added to embellish the border. 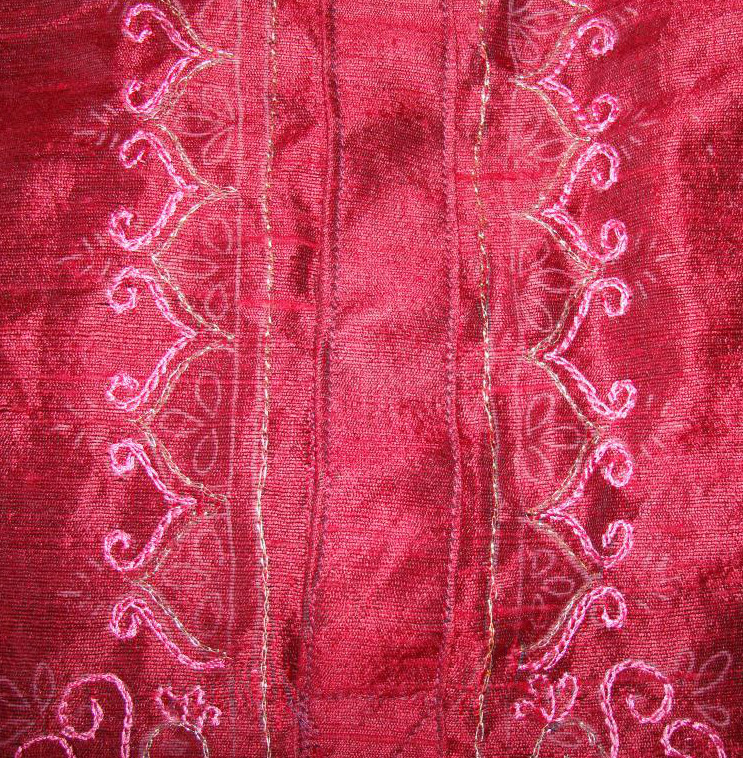 The detail of the borders after stitching the stones. The detail of the peacocks with white stones for eyes, embellished with red stones and zardosi work. I was in a hurry to finish the embroidery and let the tailor do his work. 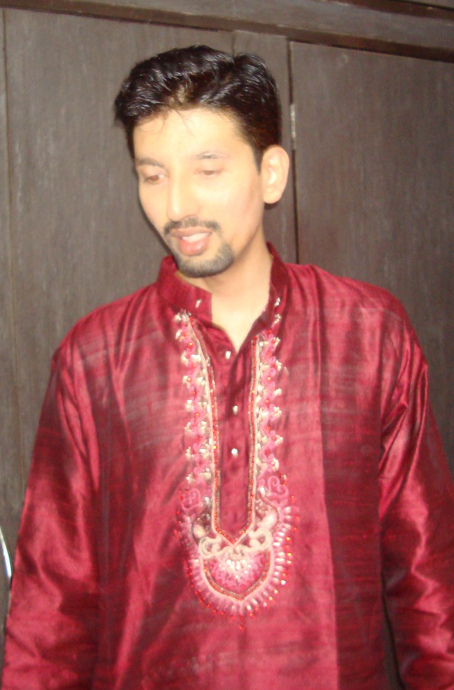 In India, these days, men’s kurtha are embellished very heavily. I wanted to do this for my nephews. I feel happy seeing the pictures. My second nephew got married last year. 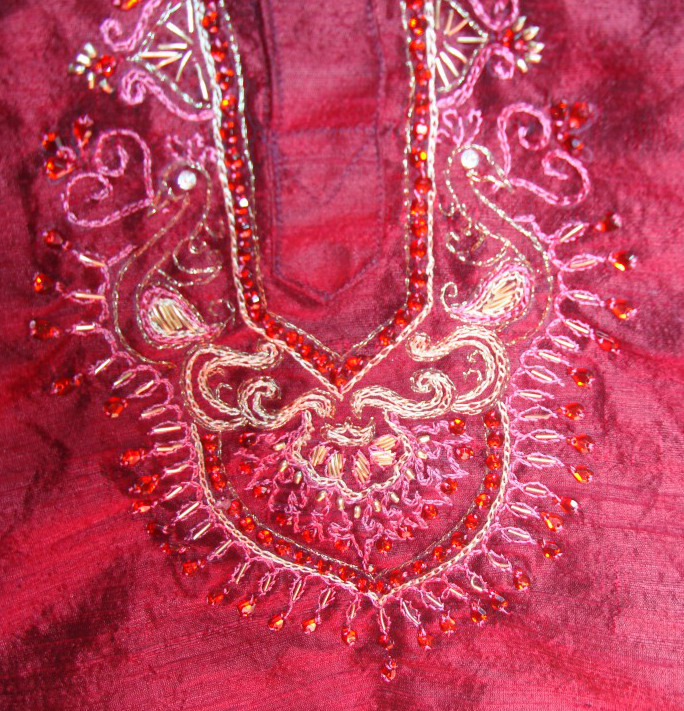 I have two nephews, For the engagement, I designed and embroidered two kurthas for each one of them.. 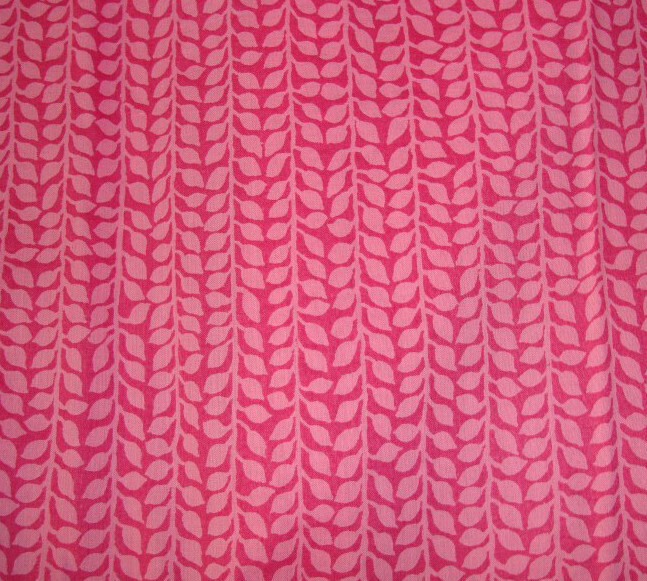 Both these fabrics were fine silk. 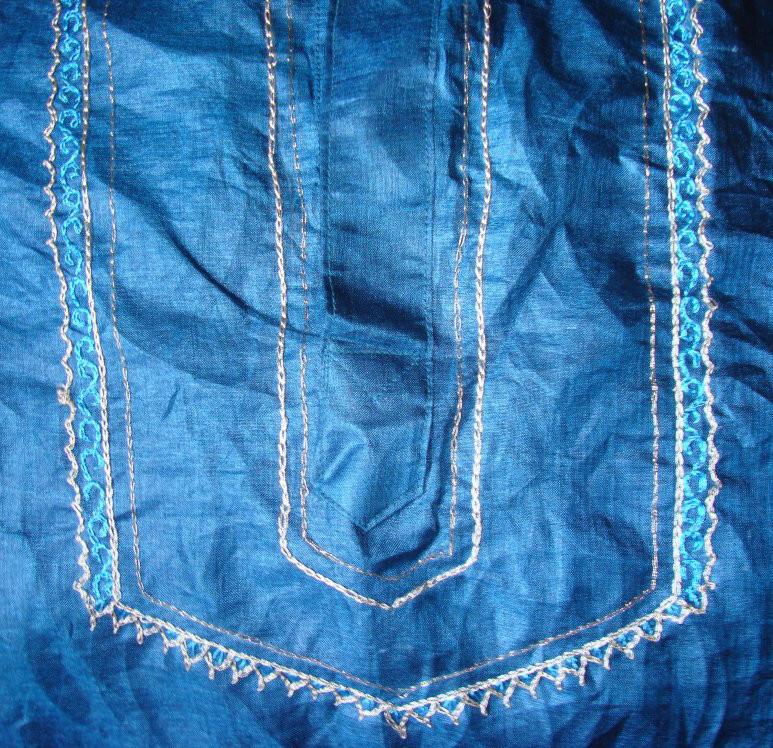 This blue kurtha was designed for the elder one [Deepak]. We found a tailor, who was willing to cut the fabric for working this embroidery. 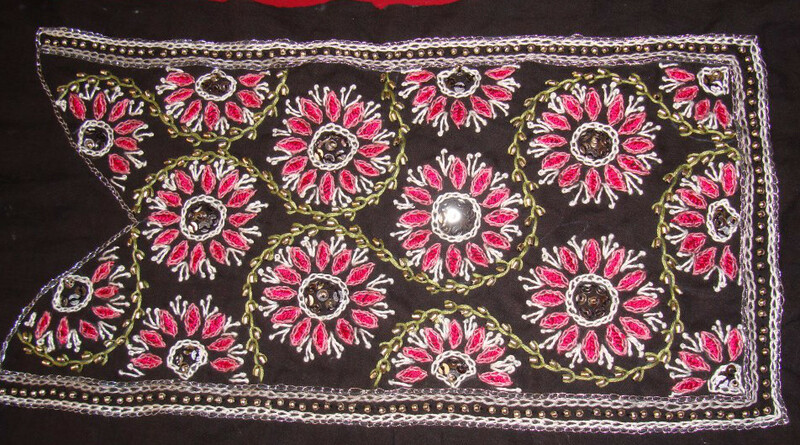 The embroidery was done in chain stitches. 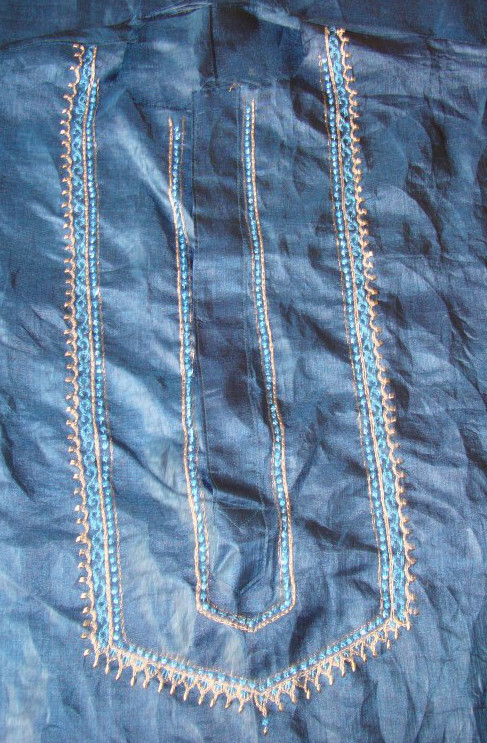 Silver metallic, light blue and white were the fine silk threads that were used for the embroidery. The tailor did his job and my nephew wore this tunic during the occasion. I designed and embroidered a kurtha for the groom. Which will be my next post. 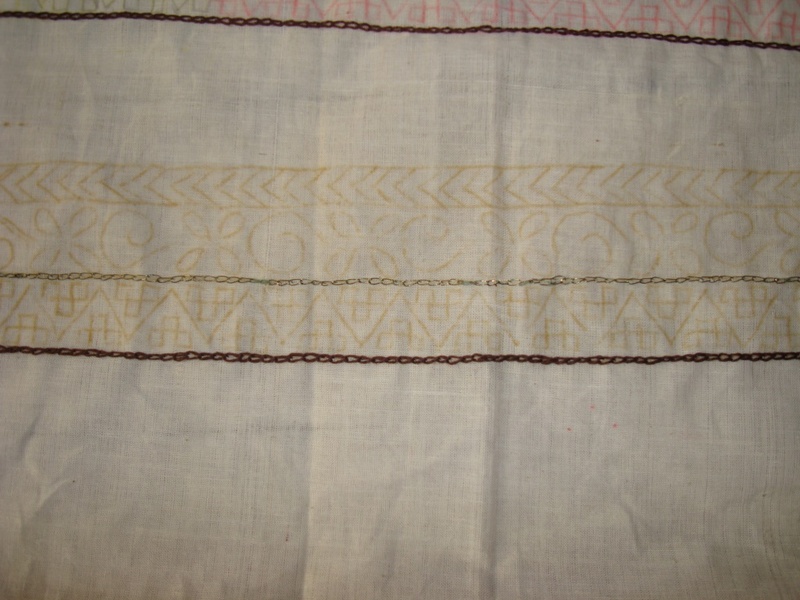 I wanted to make simple yoke in kutchwork. My new niece [Charanya] mentioned she liked black and red combination. 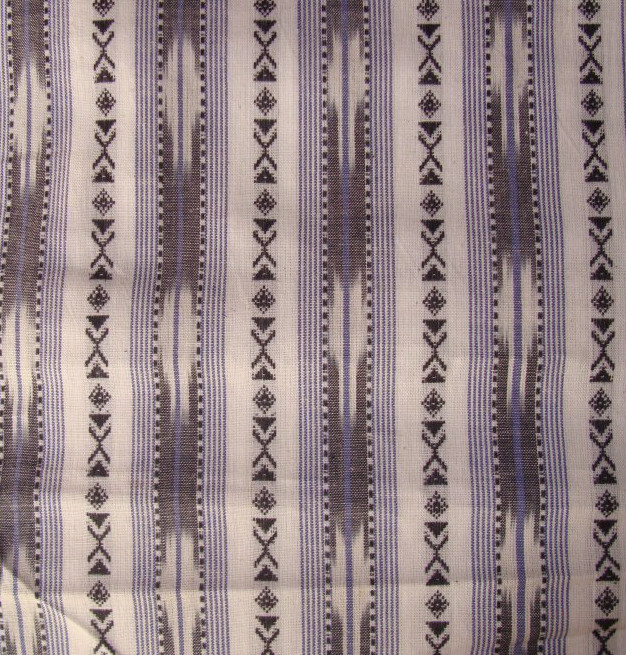 I thought this combination would look good on white ikat fabric. 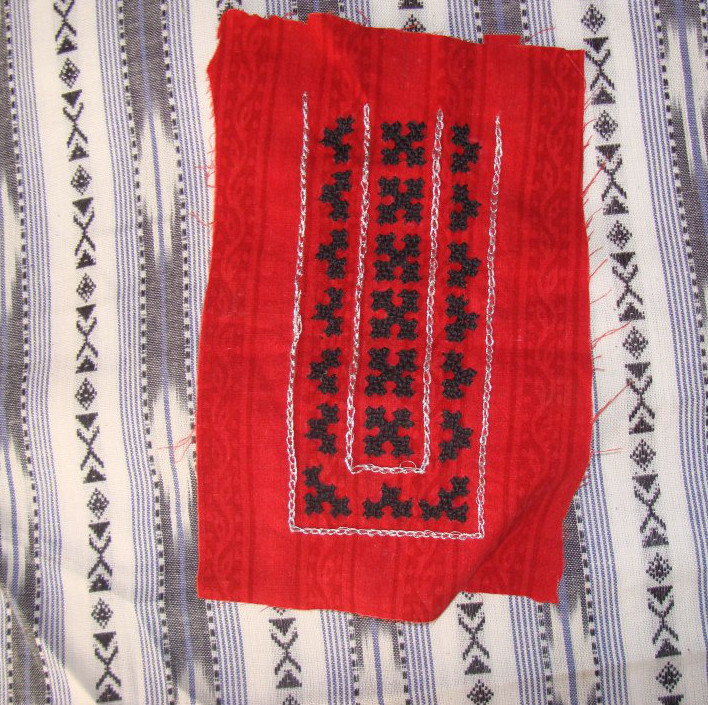 Simple yoke had small kutchwork elements. 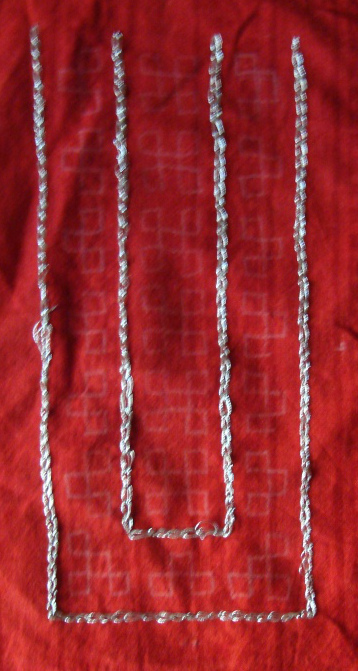 The outline in chain stitch with silver metallic thread. 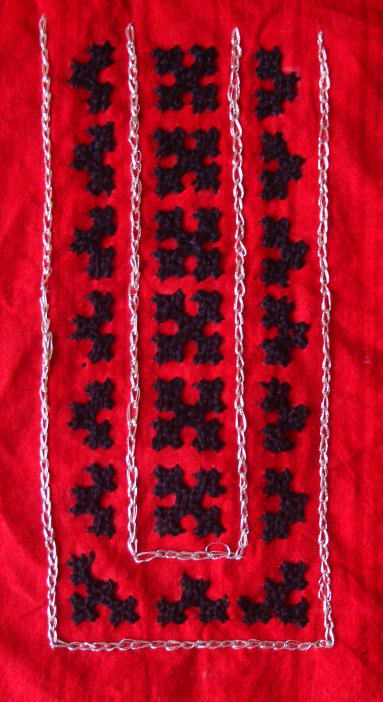 After working the kutchwork in black thread. 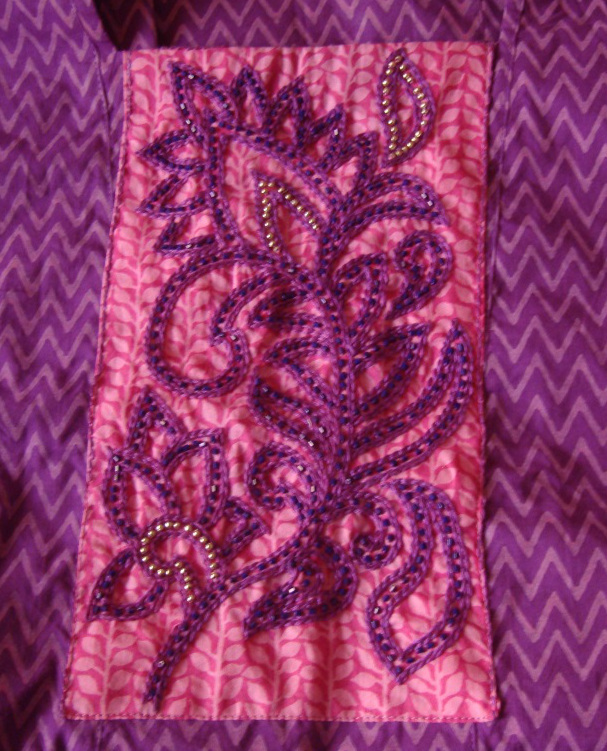 The yoke placed on the ikat fabric. She was surprised by this gift, when she visited me the first time.